Niall and Cillian Vallely learned their music the old-fashioned way - from their parents Brian and Eithne, who founded the Armagh Pipers’ Club, a group that for over three decades has fostered the revival of traditional music in Ireland’s north. 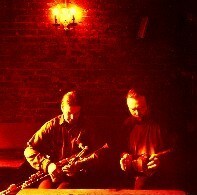 Brian Vallely plays the Uilleann pipes and Eithne the fiddle, but Niall instead took up the concertina, an instrument not usually associated with music from Ulster. His fearless exploration of the concertina’s undiscovered capabilities has helped redefine its role in irish music. Based since 1988 in Cork City, Niall was a founding member of the well-known group Nomos. He also played a prominent part in Mícheál Ó Súilleabháin’s ‘River of Sound’ television project and has performed in recent years with piping great Paddy Keenan, bluegrass mandolinist Tim O’Brien, and singer Karan Casey, his partner in life as well as music. Niall’s solo recording Beyond Words was released in 1998 to much critical acclaim. Cillian took up his father’s instrument and polished his skills with tutelage from the late Armagh piper Mark Donnelly. His mastery of chanter, drones and regulators, and of all the accents and moods of the traditional piping idiom, place him in the first rank of today’s Irish pipers. Cillian now tours with the group Lúnasa, and has also performed extensively in America with groups such as New York’s Whirligig and Paddy O’Brien’s Chulrua, and has appeared with fiddler Seamus Connolly, Riverdance on Broadway and Tim O’Brien’s The Crossing.